The Botia Robusta has been given a truly fitting name, the Chinese Golden Zebra Loach! The Chinese Golden Zebra Loach Sinibotia robusta is a lively darling, and fun to watch. This loach is quite the elegant looker with its rich golden body and contrasting bold black bands. True to its name, this loach has a yellowish or golden background color with black bar markings. This makes for a striking appearance. This loach was previously just simple known as Botia Robusta, which was also its earlier scientific name. But as things get sorted out in the taxonomical and aquarium worlds, handsome fish like this one also get sorted out. Besides being now called the Chinese Golden Zebra Loach, it is also known as the Kansu Loach. This name comes from one of its places of origin, which is the Gansu (Kansu) Province in China. The golden and black coloration is found on the Botia Robusta both as a juvenile and as an adult. There is a horizontal striping across the head and through the eyes, followed by dark vertical bands along the rest of the body and through the dorsal and tail fin. The dark bands also tend to fork into two narrower strips at about the center and as they wrap under the belly. The pectoral fins are a translucent yellow. Though generally a good community fish with other loaches and tank mates, the Botia Robusta are quite active and can get aggressive. They have been reported to occasionally nip the fins of their tank mates when feeling agitated. They can be kept in small groups of their own species (three or more), but they are also a more independent loach and can be kept singly as well. Because they are naturally nocturnal, they will be active at dusk and in the evening. They also enjoy snacking on snails, so are good for snail control. The Chinese Golden Zebra Loach is one of the loaches that can be acclimated to a brackish type aquarium. The water can be medium to hard and they can handle a fairly broad temperature range. Like all loaches the Botia Robusta will appreciate lots of hiding and resting places in caves, rocks, and roots. They also like a planted aquarium but with open space for swimming. The Chinese Golden Zebra Loach Sinibotia robusta (previously Botia Robusta) is found in Asia from the Pearl River basin in southeastern China and in northern Viet Nam in the Cao Bang Province. It was first described by Wu in 1939 from a species found in Li Kiang of southern China, and later by Mai 1978 from the Tây-Giang (Hsi-Chiang or West River) of China. Other common names it is known by are Botia Robusta, its earlier scientific name, and Kansu Loach, derived from one of its places of origin, the Gansu (Kansu) Province in China. These Loaches have been recorded in tributary drainages of the Zhu Jang systems which is one of the most populous and industrialized in China. Because of this the waters are highly polluted and there is concern about the well being of the aquatic life in the area. However this species is listed on the IUCN Red List as Data Deficient (DD). It has a relatively restricted range, but there is a lack of information about its distribution or any direct threats to the species. In their natural habitat it is assumed that these loaches tend to gravitate to the slow and moderate flowing parts of rivers and streams where there are clear waters and a sandy/rocky type substrate. They are a benthic predator and hunt insects, crustaceans and smaller fish. The Botia Robusta is a moderately sized loach. It can reach between about 5 - 7 " (13 - 18 cm) in the wild, though they are usually on the smaller side in the aquarium with a lifespan of about 8 - 10 years. This loach has a yellowish or golden background color with black bar markings. This makes for a striking appearance and is found on the Botia Robusta both as a juvenile and as an adult. The horizontal striping across the head and through the eyes are followed by dark vertical bands along the rest of the body and through the dorsal and tail fin. The dark bands also tend to fork into two narrower strips at about the center and as they wrap under the belly. The pectoral fins are a translucent yellow. Size of fish - inches: 7.1 inches (18.01 cm) - It can reach about 5 - 7 " (13 - 18 cm), but is normally a bit smaller in the aquarium. Lifespan: 10 years - Their life span is about 8 - 10 years. The Chinese Golden Zebra Loach can be hardy under the right conditions. They are not recommended for beginners because of their need for pristine water and having small body scales. Reduced scales makes them more prone to disease and very sensitive to medications used to treat disease. Experience in treating scaleless fish is very important to be able to give your loach a healthy and long life. Do not try to introduce these fish into biologically immature tanks. Since they are omnivorous, the Botia Robusta is not a picky eater. In nature this loach feeds primarily benthic organisms, insects, crustaceans and smaller fish. In the aquarium it will generally eat all kinds of live foods, sinking pelleted and tablet foods, flakes, and algae. They like frozen foods as well. To keep a good balance give them a high quality flake or tablet food everyday. Feed mosquito larvae and brine shrimp (either live or frozen), tubifex, daphnia, and some vegetable foods such as algae wafers. They will also eat snails, so are good for snail control. The most important thing for these loaches is that they always have clean and well-oxygenated water. Frequent water changes of about 30% a week are needed. With your weekly water change make sure to vacuum the gravel to remove all excess food and waste. Make sure not to remove the biofilm on rocks, decor or no viewing panes of the tank. A magnet algae cleaner normally does a great job in keeping the viewing pane clear. The Chinese Golden Zebra Loach is mostly a bottom dweller, but will occasionally swim in the middle of the aquarium. Because these fish do best in groups, a larger tank of at least 30 gallons will work best. Never introduce this loach into a biological immature setup as these fish require pristine water. They need good water movement that provides plenty of oxygenation.The tank should turnover at least 10-15 times per hour, powerheads and airstones can be introduced to achieve proper flow and oxygenation. An undergravel filter is a great choice for these fish as it creates high oxygen through out the tank as well as reducing the waste. This is one of the loaches that can also be acclimated to a low-salinity brackish water aquarium. Keep specific gravity less than 1.005 and preferably less than 1.003. Substrate Type: Sand/Gravel Mix - Should have larger smooth rocks for shelter as well. Temperature: 65.0 to 75.0° F (18.3 to 23.9° C) - In the wild they enjoy a subtropical 65 - 75° F (18 - 24° C), but have been kept in the aquarium at 77 - 83° F (25 - 28° C). Though they are generally a peaceful community fish, they are quite active and can get aggressive. They have been known to nip the fins of their tank mates when aggravated. They can be kept with their own species but as they are a more independent loach, they can also be kept singly. These loaches form a social hierarchy and should be kept in groups of 5 or more if tank is big enough. Any less and the dominant loach will act out towards any fish that is of similar shape. 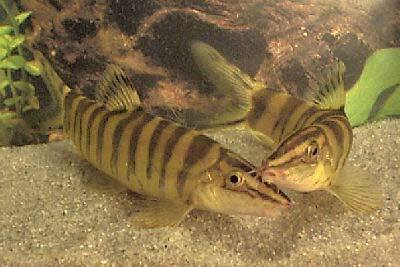 And if kept in pairs the dominant loach will normal attack the other and prevent them from eating. Singly they will normally do fine, but may be a bit on the shy side. Slow Swimmers & Eaters (): Monitor - Is known to nip the fins of slow swimming long fined fish. Shrimps, Crabs, Snails: Threat - is aggressive - Will eat snails. Most of the time, though not always, females should have heavier bodies. The Chinese Golden Zebra Loach have not been bred in the aquarium and they are not yet bred commercially. In nature these loaches are seasonal, possibly migratory spawners. An outbreak of disease can often be limited to just one or a few fishes if you deal with it at an early stage. When keeping these sensitive types of fish, it is common to catch deteriorating water conditions and disease before other fish are affected. The best way to proactively prevent disease is to give your Chinese Golden Zebra Loach the proper environment and give them a well balanced diet. The closer to their natural habitat the less stress the fish will have, making them healthier and happy. A stressed fish will is more likely to acquire disease. The Botia Robusta, also called the Chinese Golden Zebra Loach, is occasionally available both in pet stores and online. I have 3 of these fish in my 33 gallon and are my favourite fish. They are very shy mainly due to their nocturnal habits but will eventually get used to you coming near the tank. I have had great success with blue LED lights that are normally used for reef tanks. The blue lights let these fish come out at night when they are much bolder and you will still be able to see them. They can be quite inquisitive, they will be quite happy to sit and watch you whilst you watch them. Their eyes are not so fixed to their heads, they can move them so they can look right at you which is really nice. These fish like to snuggle up close with each other for comfort and have been known to tussle with each to get comfortable :D I've seen them occasionally sneer and push away another fish that comes near their spot but... 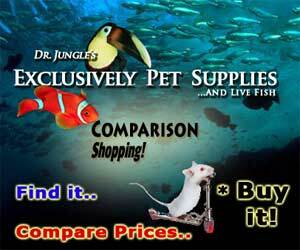 I have mine with neon tetras and I trust the loaches 100% with them. My fish love live food and frozen food like Daphnia and even blood worms if they manage to get some :S but their staple diet are the plant pellets that I feed them. (I think they'd be the first to eat eggs so be careful if you breed). Not had much luck with cucumber or spinach but working with other veg. They are fantastic snailers too so don't deliberately mix them with snails. Although they don't need a shoal, from what I've seen of mine, they seem to appreciate the comfort that a couple more give them. These fish need immaculate water to feel comfortable, in less than perfect conditions mine hide away more. In fresh water, they become more playful and even swim in the center of the tank more. I have one in a 10-gallon tank mixed with several guppies...they do well together...my botia does like to chase the guppies but it hasn't killed anyone... I'm new to fish and the guy at the pet store said it would work...does anyone see any problems? I've had him mixed with my guppies for about 2 months...would he need a bigger tank soon? There are other bottom dwellers in my tank but I only have one botia robusta. He was aggressive at first but now is fine. I have 5 Sinobotia robusta in a 120 gallon tank. They are together with a group of Clown, 15 harlekin tetras, 15 dwarf rainbow fish and probably more than 100 shrimps. I got some 15 four years ago, they have multiplied since, despite the group of loaches in my tank. There are enough places to hide, both for the big and smaller species, provided by rocks, wood and lots of Java ferns growing on the woods and the back. The Sinobotia seem to be very social fish, they swim together, often lay close to each other, touching each other. Not so shy at all, as I can see them very often during daytime. I have not seen them going after other inmates. So according to me, rather peaceful fish. they are a curious species, come out to see what we do. beg for food with all the other fish. A species I would recommend to have in a group. I have one of these botia robusta in my 55 gallon tank and I must say he is pretty aggressive when he wants to be. Right now I have him in there with a 5in texas and 2 juvenile severums and he owns the aquarium. The texas and he got into a huge fight the first day over a cave, and the botia won. He regularly chases the severums right off the bottom if they go anywhere near the bottom of the aquarium. Very interesting fish, very tough, and he holds his ground when he has to.